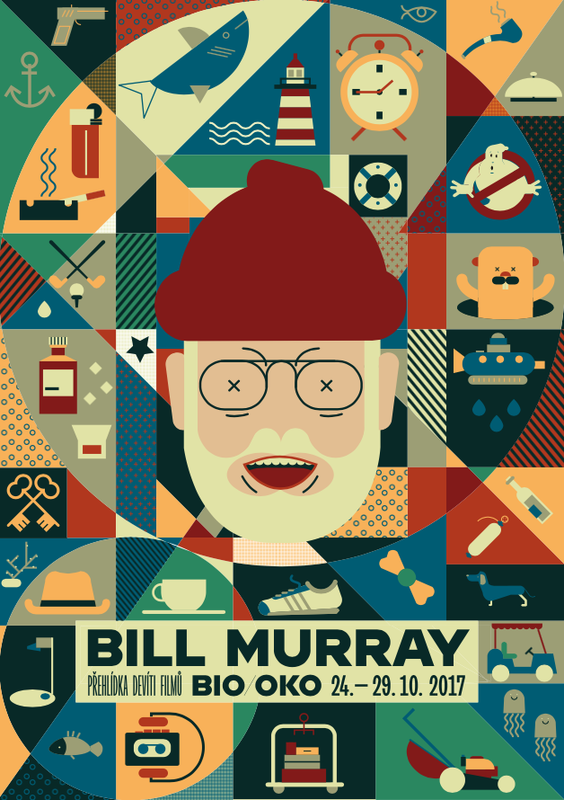 William James Murray, a man who has developed somewhat of a cult following in recent years, was worshipped in hipsterdom from the 24th to the 29th of October as Prague 7’s indie kino kingpin, Bio Oko, hosted 13 screenings over six days for their Bill Murray Film Festival. Actor, comedian, writer, middle-aged heart-throb Bill Murray is known for cult classics like Groundhog Day (1993) and Ghostbusters (1984), as well as for some more touching performances like that in Lost in Translation (2003). Some of his lesser known (but just as excellent) appearances are those of director Jim Jarmusch’s 2005 Broken Flowers, and 2003’s Coffee and Cigarettes, additionally, Murray is a frequent cast member of many cherished Wes Anderson films appearing in central roles like that in Rushmore (1998) and The Life Aquatic with Steve Zissou (2003) as well as brief appearances like that of a hotel-owner in The Grand Budapest Hotel (2014). 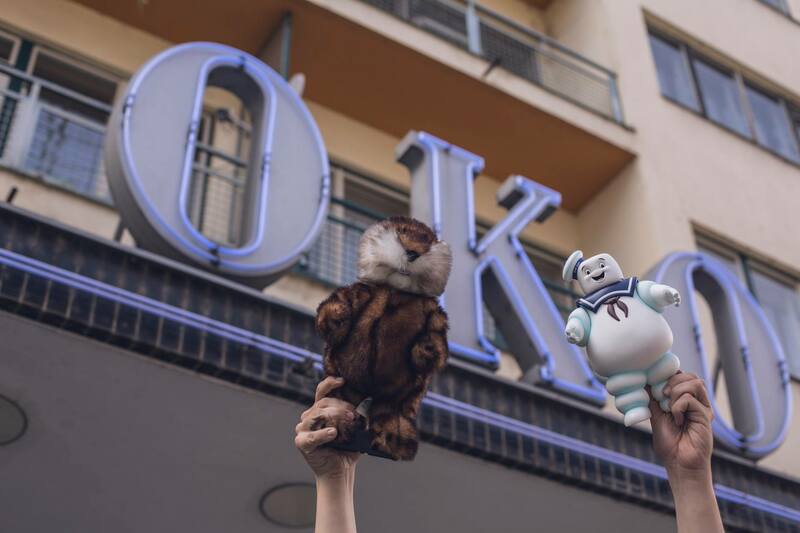 Oko employees donned their Zissou red beanies and handed out bowls of marshmallows to adoring fans with Murray-laced excitement in their hearts. Although the amount of guest beanies, striped shirts, and canvas bags wasn’t particularly alarming for Holešovice, it was the concentration of them that one realized there were some true hipster forces pulling the artsy masses to the Murray themed screenings of that week. I spoke to a former high school classmate of mine, the only true Billy Murray fanboy I know, if he had any comments on the attention the 67 year old actor is getting in Prague or if he had any great Bill Murray wisdom to share, to which he responded “Hahahaha no you got it” an answer so aloof, Murray himself would of have been proud. Mind you my friend is a guy so captivated by The Murricane, he once wheat-pasted a Bill Murray head on the crotch of a statue of Hannibal Hamlin, the 15th Vice President of the United States, he’s the Bill Murray fan the world deserves and (as seen by this festival) clearly the one it needs right now. I ended up bookending my festival visits by seeing the very first and very last screenings of the week. I made my way to Oko’s top balcony for a squeaky center seat for the first showing of the festival, Jim Jarmusch’s Broken Flowers (2005) on Tuesday the 24th of October. Murray plays an aging Don Juan character appropriately named Don Johnston who receives a letter from a anonymous former lover explaining he has a son. Against his initial dismissal of the idea, he eventually goes on a cross-country trip planned by his wannabe-detective neighbor to catch up with four of his former love interests to find out which one he had conceived a child with. The final act of the film sees Johnston coming back home unsuccessful only to encounter a young man he believes to be his son and the film ultimately ending with the audience questioning if this really was his mysterious son or not. A lovely character-driven film of course, with Murray lightheartedness sprinkled in but as goes the Ján rating system, because it didn’t (yet) make me want to sulk about my life, it can’t get the full 5, Ján’s final call: 4.2/5, sorry Jarmusch. By the final day of the Bill Murray extravaganza it seemed everyone was happily Murrayed-out with their souls filled with good laughs and happy tears. In typical Ján fashion for the final film I took my exact seat from the first showing (it might have be one over, sue me) on the 24th. Looking around I was pleased to see a full house had showed up for the closing film of the Murray week, Sofia Coppola’s (daughter of the famed Godfather director, Francis Ford Coppola) 2003 Lost in Translation and may I say, as shocking as it sounds, this was my first viewing of the masterpiece and I was overjoyed. Starring Bill Murray as Bob Harris a downtrodden actor being forced to shoot a whiskey commercial in Tokyo and Scarlett Johansson as Charlotte, a young intellectual who joined her photographer husband on work also in Tokyo. Their stories fuse at the Park Hyatt Hotel where both of them are staying and soon find companionship in each other while surrounded by an isolating, foreign metropolis. With the seemingly infinite urban cityscape, the film remains visually relaxing presenting a chance friendship that’s never fully romantically realized until a kiss right at the end as Bob leaves Tokyo (and Charlotte), for his family back home. With an Academy Award for Best Screenplay, as well as Best Picture, Best Actor (for Murray), and Best Director nominations, the expertise in storytelling on Coppola’s part clearly runs in the family. Now this was a film to make me question my life, the stories I want to tell and the true beauty that can come out two strangers connected by loneliness in a foreign place. A film that makes me want to melt into a little existential puddle. That sort of self-contemplation and existential loneliness is why Lost in Translation gets the coveted Ján 5/5.